In 2018, the actuarial associations of the world reached the impressive number of 100,000 members worldwide. Therefore, we wanted to celebrate this milestone for the actuarial community as part of the International Congress of Actuaries 2018 in Berlin. The idea of this prize draw “I am 100,000” was to find and honour an actuary who is representing his or her colleagues from all over the world. Find out who the winner of the prize draw was. A world congress depends on the positive influences and the personal exchanges between participants from various nations. Therefore, an important aim of the International Congress of Actuaries 2018 in Berlin was to offer participants from all regions of the world the opportunity to be a vital part of a diverse and multinational network. To support the valuable Bursary Program of the International Actuarial Association, the DAV has launched the charity campaign “Actuaries For Actuaries” in order to enable even more actuaries from emerging countries to participate in the ICA 2018. Actuaries worldwide could participate and helped to raise funds for the project. At the ICA 2018, participants could not only expect an excellent congress program with around 200 lectures and talks given by 250 speakers and an entertaining social program, but also some fine tunes. ICA 2018 also supported two music groups by members of the German Actuarial Association. “Carl Friedrich and the Abnormal Distribution” play powerful rock ‘n’ roll music while “Carl Friedrich and the Harmonic Series” prefer more sophisticated a-cappella sounds. The ICA 2018 is considered to be one of the leading international conferences for actuarial science and mathematical finance. What better way to emphasize this claim than with a mathematical formula resulting in “2018”? 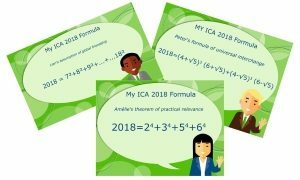 That was the challenge of “My ICA 2018 formula”! The aim was to collect as many different formulae equal to “2018” as possible. In order to achieve this goal, we challenged you to participate by sending us your personal formula.